It’s big, it’s brash and, in parts at least, it’s beautiful. Dubai is a dazzling metropolis in the middle of the desert. The realisation of a monarch’s dream to make the city a world-leading wealth generator, it is famous for its sky-high towers and its addiction to world firsts, biggests and tallests. 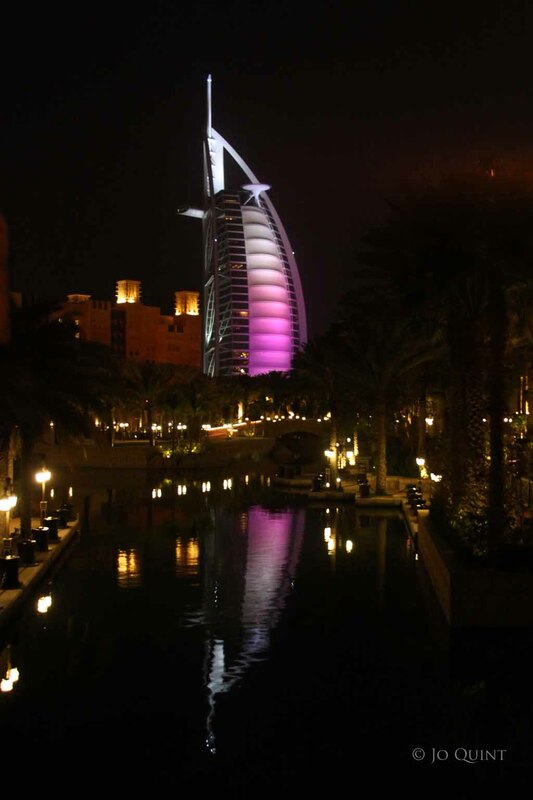 In the heart of the Arab middle east, a Westerner might think that a trip to Dubai would be an educational voyage of discovery into the culture and habits of the Arab world, but in reality, this commercial congregation of businesses and tourists from across the world makes this city very much Middle-East lite. One of seven Emirates (collectively, the United Arab Emirates – UAE), Dubai gained independence from the UK on 2 December 1971. Since then, businesses from across the globe have flocked to the region, seeking a ride on the wealth-propelling (if a little bumpy) rocket that is this ambitious and forward-thinking city. For all its seven star hotels, shopping malls (one with an aquarium, one with a ski centre), majestic buildings and crazy developments (man-made islands The Globe and The Palm spring to mind), Dubai, for me at least, lacks a sense of sincere culture and soul. Perhaps all the money spinning mirrored glass has diluted the culture of 50 years ago. That’s not to say it’s not worth a visit. It absolutely is. It’s one of those destinations you mark as an ‘experience’ and from a photography point of view, there’s plenty to keep you happy. Just a note of caution. If you’re going to go, do so armed with a pre-set budget and don’t be afraid to use it. There’s no such thing as a beach-front Travelodge. It’s pretty much 5 star or no star. We visited in March. The weather was beautiful – the skies were blue (other than the days of the sandstorm! ), the beaches white and the sun bounced off the steel and glass. 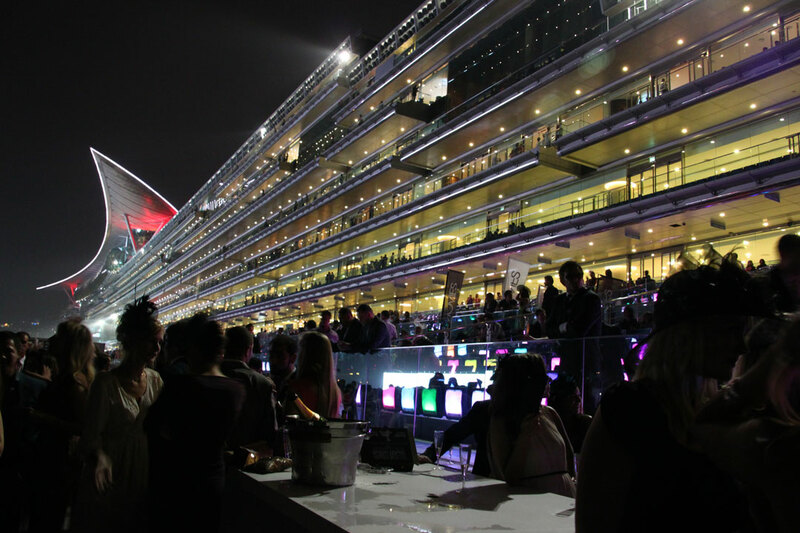 My brother in law, a Dubai resident, had bought us tickets to the Dubai World Cup – an experience like no other. A fashion show for Western expats, whose principal aim is to quaff champagne whilst getting papped for the local glossies and websites, the horse racing is a purely incidental affair for the majority of race-goers (Westerners may be influenced by the no-betting policy [do it before you leave home via the internet if you must]). At a mile long, with a capacity of 60,000, and lit seats reminiscent of an 80’s dance-floor, the grandstand is extreme, whilst the no-expense-spared, statement-making fireworks were as dramatic as you’d expect. There were lots of them. They were loud. They were pretty. There was an aerobatic display from a spitfire. Yes, it was impressive. Elsewhere, the Burj Khalifa, the tallest building in the world, situated just outside the largest shopping mall in the world (The Dubai Mall, complete with must-have aquarium) is a must-see. We went for Afternoon Tea – and with treats like these, why wouldn’t you? The best view, so we were reliably informed, is from the ladies toilet. And yes, it’s pretty good. This is the vertigo-inducing view from the restaurant. Not bad? Then there’s the fountains. “You must see the fountains” friends had implored before our trip. If I’m honest I can take or leave fountains. Not these fountains. You absolutely HAVE to see these fountains. 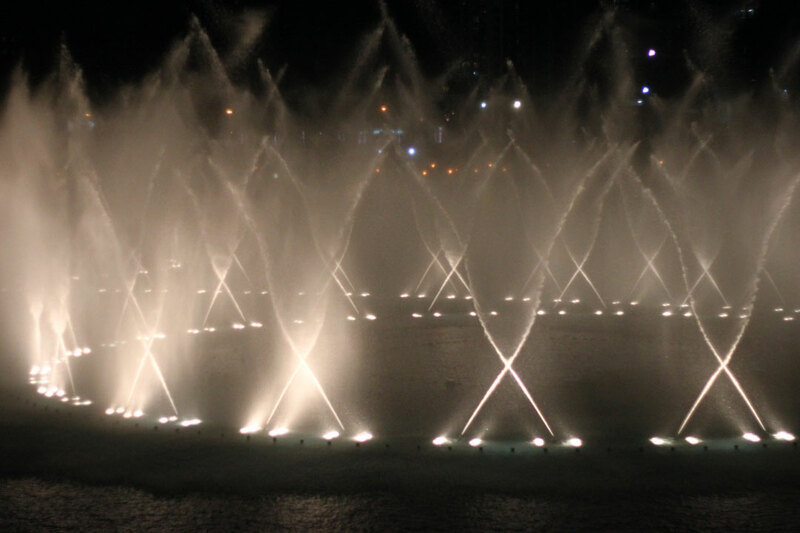 Every evening, a display of synchronised water dancing takes place in the 30-acre lake at the foot of the Burj Khalifa. 275m of fountains, shooting up to 150ft tall, the creators of the Bellagio fountains in Las Vegas masterminded this installation. It’s free, but my recommendation would be to book an outside table and eat at one of the restaurants overlooking the fountain ‘arena’. We ate at Mango Tree. The food was amazing and the view pretty crazy. The best part was seeing the fountains moonwalk to Michael Jackson’s Thriller, which you can see here via the wonder of YouTube. And finally, the Burj Al Arab, the iconic hotel on the Jumeriah Beach. Beautiful at night and well worth a photo. A good spot is from the bridge outside the Souk Madinat Jumeriah. Of course, there’s plenty more to see than all of this. There’s the creek, the gold souks, the golf courses, the sandy beaches and the ski centre. Naturally. © Jo Quint 2011-2013. Yes, this blog and content are copyright protected, but in the true spirit of social media, it's all about sharing. I’m a great believer in proper referencing and linking and giving credit to the works of others – whether blogs, websites, text or images. As such I’m more than happy for you to quote from my blog – all I ask is that you link back. Yes, there’s copyright on my images, but if you would like to use them, just drop me a line – I’m happy to chat.